A couple of weeks ago, I signed Sprout up to the Weekend Box Club. 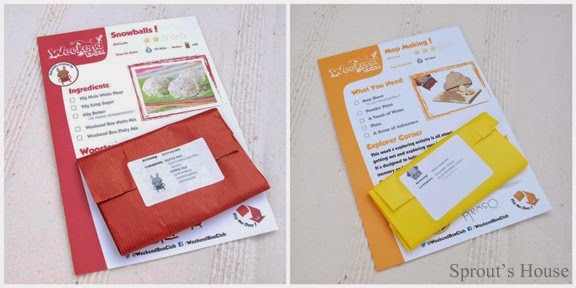 It's fantastic company that will send you (monthly or fortnightly) a box filled with four different activities to do with your child. Each box contains something to make, something to cook, something to read/write and something green. The best thing about these boxes is that they contain virtually everything you need for each of the activities. The boxes are dispatched on Tuesdays and arrive on Friday mornings just in time for the weekend! 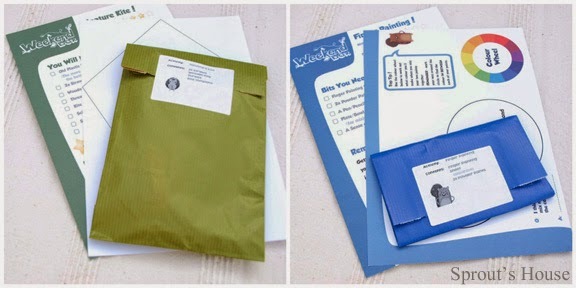 I received an email telling me that my box had been sent and also listing the extra ingredients that I would need for the recipe activity so that I could add them to my shopping list if I needed to. 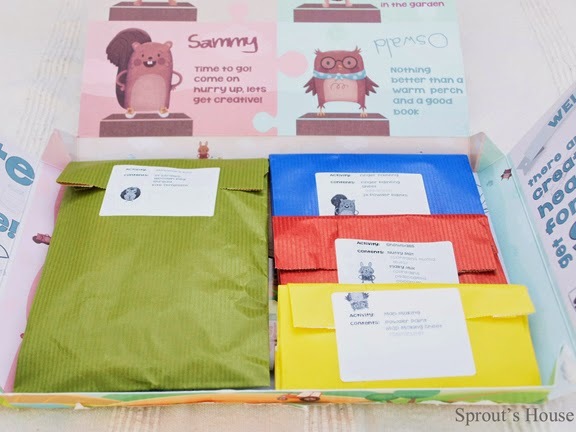 When Sprout and I opened our first box, it contained four coloured activity cards, four packages colour co-ordinated to match the activity cards, a kite template, a finger painting sheet, a set of stickers and a chart to record each Weekend Box you complete so you can claim your special surprise after six boxes. Can you tell that Sprout dressed herself this morning? I like to think that she's fashion forward rather than fashion disaster!! In our box, the green activity was making a miniature kite out of an old plastic bag using a couple of straws, some thread and a peg. Sprout loved sticking the straws to the plastic bag especially as they were pink! 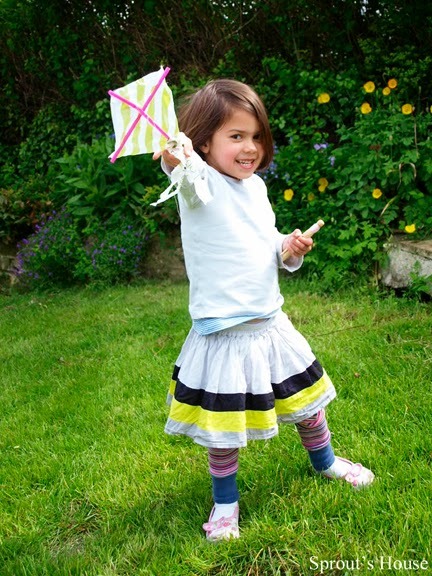 She then had a great fun in our garden flying the kite! The writing activity involved finger painting using two different coloured paints. 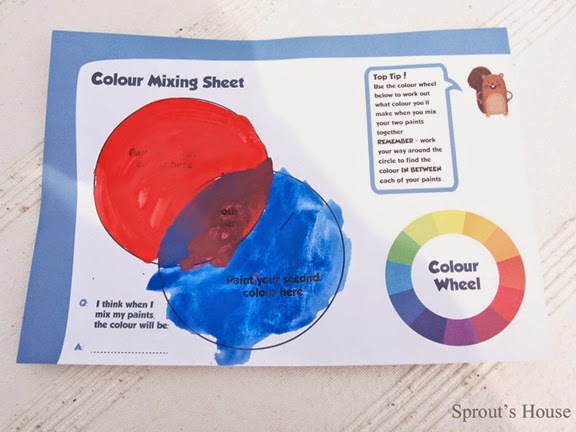 Sprout enjoyed mixing the powder paints with water, and then mixing them together to see what colour they made. I was most impressed when she said that red and blue would make purple..... She then used her finger to write her name. The cooking activity was a recipe for Snowballs using plain flour, icing sugar and butter as well as two special ingredients included in our box - a nutty mix and a flaky mix. Sprout weighed out each of the ingredients, mixed them together and attempt to shape them into balls. Yum! The create activity was to make a map of our garden or local area. This was the only activity that we didn't get around to doing this weekend so we're saving it up for next weekend! 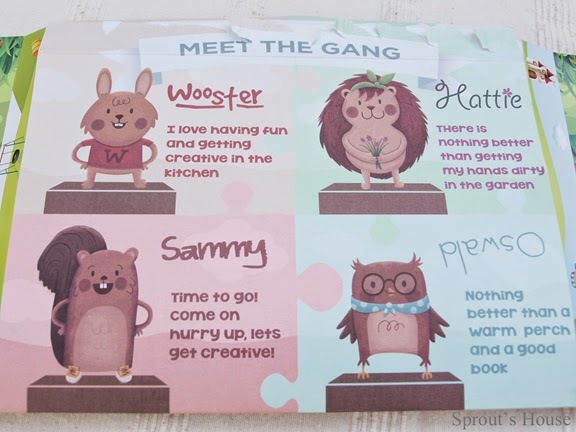 Each activity is linked to a forest character - Hattie Hedgehog is in charge of the green activities, Sammy Squirrel oversees the creating activities, Oswald Owl does the reading/writing activities and Wooster Rabbit creates the recipes. 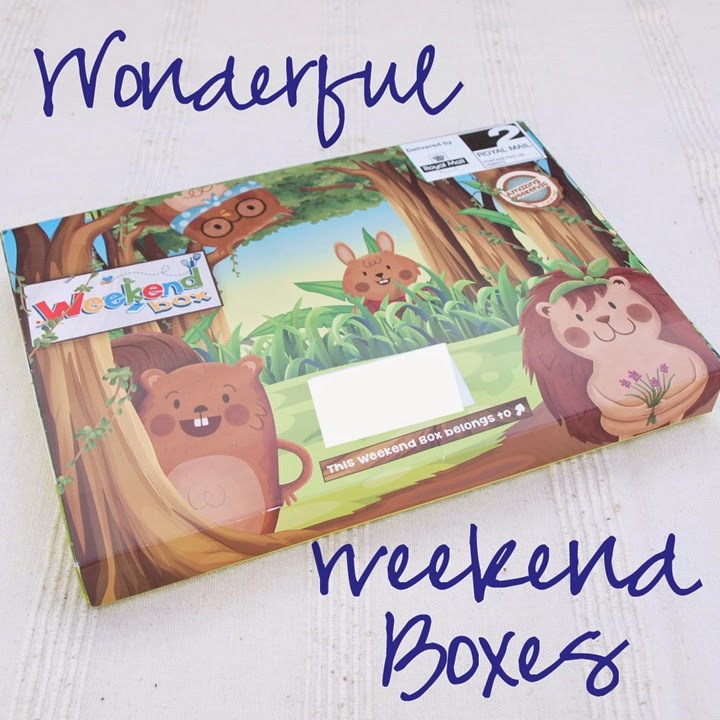 The Weekend Box Club has really impressed me from their customer service to the quality and variety of activities that we received! Each box costs just £7.50 and as I mentioned earlier you can opt for monthly or fortnightly, plus you can even pause your boxes if you know your weekends are going to be busy or you're going to be away!! I hope you and your small ones have as much fun as Sprout and I did!! Enjoy! Disclosure - I have not been compensated in any way for this post by the Weekend Box Club. If you use the promo code I will earn credit towards future boxes. Oh I am definitely considering ordering my free box of this! It looks like fun! never heard of these boxes before. but will defo be trying one out!